An epigraph is a short quotation which is placed between the poem and its title. I have heard people wonder aloud about why poets do this, and some people even think it is there to show off how erudite the poet is. I’d be interested to hear from other poets their reasons for using epigraphs too, so drop a comment if you can add to my list. my magical five pointed star. I wrote this poem and then during the redrafting, realised I’d unconsciously echoed a line from the wonderful Leigh Hunt poem ‘Jenny Kissed Me’. I did not want to change my line, so I added the epigraph to show my debt to this poet from the past. The lines I chose not only acknowledge my debt but pithily summarise one of the themes of my poem, carpe diem. 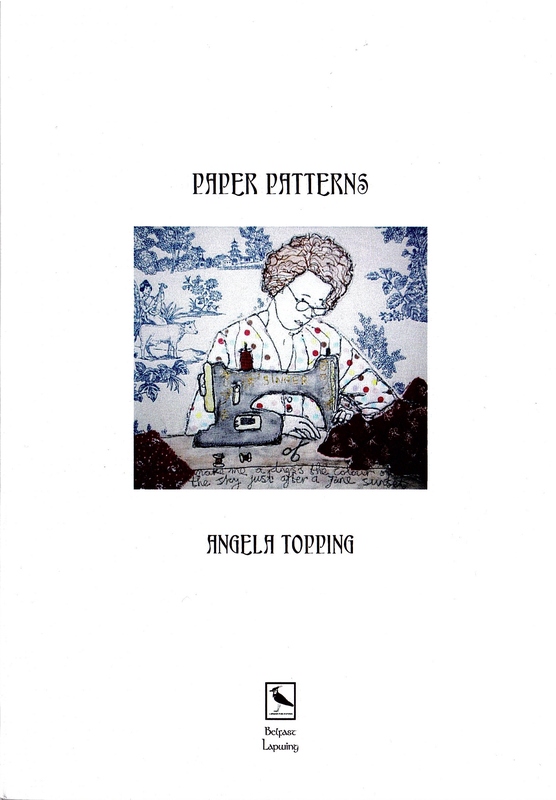 Copies of Paper Patterns are available from me, or from the publisher’s website. We set off on Tuesday morning, with all the art work for the exhibition, ‘The Lightfoot Letters’, neatly stacked in the car. Wednesday morning was spent putting up the exhibition in the Preservation Trust Museum, assisted by the curator, Sam, who was a fantastic help. It took over four hours but we were very pleased with how it all looked. A lot of people came up to me during the week wanting to discuss the exhibition, which was lovely. It really was an amazing co-incidence that Maria Walker had purchased the letters long before she met me and we had both produced work on the family prior to starting to work together. 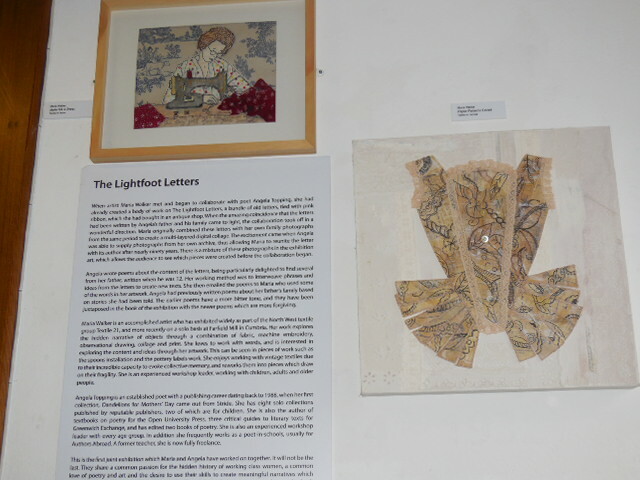 As I said at the artists’ talk, in a sense both of us were collaborating with the letter writers as well as each other. Maria often used words from the letters as a title for a work, or included the words on the art. I referenced the letters a lot in the new poems I had written for the project, for example, in my poem about my grandmoher Ada Lightfoot, nee Woodward, whom I never met as she died in 1933, I synthesised details from her marvellous letters. 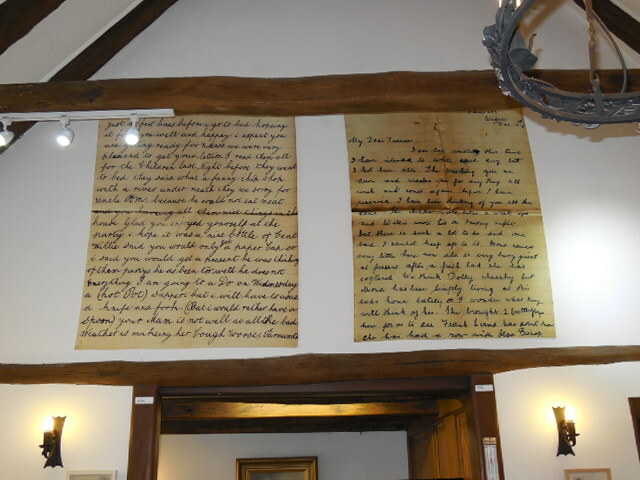 We managed to hang these large versions of the letters, scanned and printed onto cloth, above the door lintel in the Preservation Trust, with sterling work from my husband scaling tall ladders to screw the battens in. One of my grandmother’s letters is on the right. The one on the left is from my grandfather, and includes the words about the hot pot supper he is attending: I will have to use a knife and fork but I would rather have a spoon’. 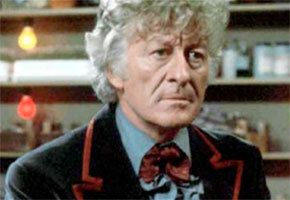 He always liked his food, but was tall and slim all his life. Maria produced two stunning pieces inspired by his words; you can just see the spoons piece to the left of the doorway. Maria had not yet done any work on the theme of skating when we met, as one of her main research interests is women’s lives. But my dad wrote three letters to his older sister during this intense 3 month period when she was away from home, and in all of them he is obsessed with skating. I worked hard at a poem to do him justice, and Maria found it a good way in to produce several wonderful pieces about skating, culminating in the amazing hanging she made, which appears to be floating from a typewriter. 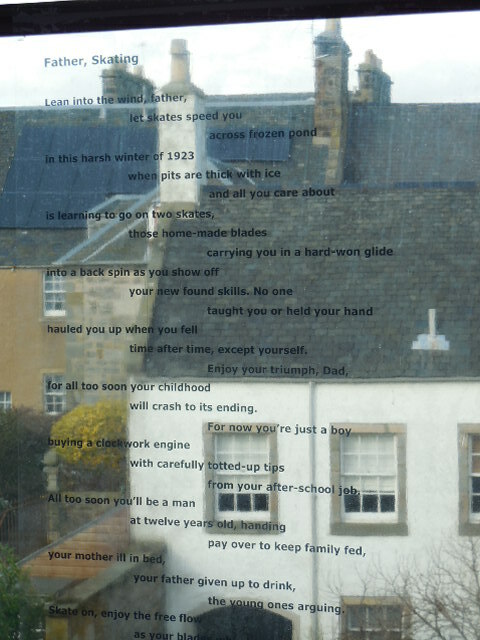 Eleanor Livingstone, the Director of StAnza, suggested that my poem, ‘Father, Skating’ be displayed on a window in The Byre, as a trail to the exhbition. It’s the first time that the poem has not been in large vinyl letters in the actual exhibition, but there would not have been space in the actual upstairs room where everything else was shown, so this was an inspired idea. I am grateful to Anja Konig for noticing it as at that point I had not been up to the studio theatre, so I hadn’t actually spotted it. It was gratifying to have pointed it out to Paul Muldoon as we were walking past it discussing his masterclass, though I did not of course mention the fact that I had submitted the poem to The New Yorker, with a disappointing result! It’s more important to me that people tell me they love this poem, and the main thing for me is that my dad skates on between the lines and is still 12 years old and carefree. 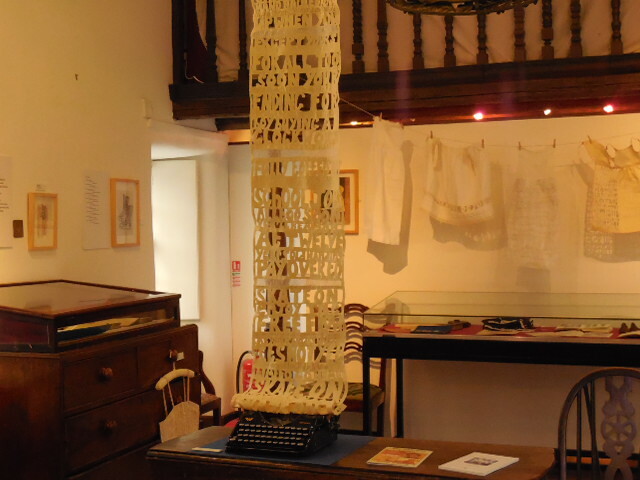 This was the first time the exhibition has been shown outside of Cheshire, and it is also the first time it has featured at a Poetry Festival. Maria and I will always be grateful to Eleanor for noticing the art and poetry collaboration in this way and inviting us. She is truly a director with a finger on the pulse of poetry. We would love it if other poetry festivals would take up the exhibition. We also offer an artists’ talk and workshops if required. And of course I love performing the poems in the sequence, which appear in my book Paper Patterns (Lapwing 2012) and the chapbook The Lightfoot Letters, which also includes the text of some of the letters themselves (Erbacce 2011). Maria and I still dream that a big publisher will one day be interested in publishing a book of the letters, poems and artwork. The letters themselves are amazing social history and there is still a lot in them to be mined.